I’m no fan of the Trudeau family; they are after all bourgeois liberals. I do however have respect for them. Particularly the elder Pierre Trudeau, who took BS from no one, insisted on being his own man and refused to participate in the embargo against Cuba at the insistence of the US government. So there is something to respect there. What I do not respect is fear mongering around Islam and the Toronto Sun. An article by Sun journalist Tarek Fatah paints a very skeptical snort view of the junior Trudeau, Justin. The new liberal politician has made a strong choice of where he is going to spend at least part of his Christmas, well, the 22nd at least. Justin is going to be a part of the “Islamic Spirit” event. He will be as you say joining thousands of young Muslim men and women in Toronto for a convention called the “Revival of the Islamic Spirit”. Where people will be getting together to celebrate Muslim identity and Islamic faith. So we should not be surprised that a publication such as the Toronto Sun would haul out their resident Muslim employee to attack it. I find this very typical of the Sun. If they chose to attack an Islamic organization (within Canada only) they seem to frequent the writing skills of Mr. Fatah. I don’t think it’s a coincidence that they chose him, a self-described moderate Muslim. It is very much like how FOX News just happens to choose a Black man to be on a program when they want to criticize or attack Black people. I do not claim to know Mr. Fatah personally, but I do find his role in the Toronto Sun very suspicious. His first claim is that the convention has links to terrorism. That ubiquitous claim that is thrown at every Islamic-everything, almost always with nothing to back up the claim. “Believed to be linked to Al-Qaeda” and “suspected to have given money to terror groups” are the common blanket baseless accusations that are thrown against a Muslim anything. What I would like is some proof that any group that is participating in the event is actually liked to or has funded terrorism. Despite this reality, I’ll give Fatah the benefit of the doubt and hear his accusations. His first is the IRFAN-Canada, a group that lost its charitable status when it was accused of sending almost $15 million to the “terrorist group” Hamas. According to a federal audit they use “deceptive fundraising” to collect funds for Hamas. Canada Revenue Agency also said the Islamic charity produced videos that said, “All Arab and Muslim nations to join in the struggle against Israel and glorify martyrdom.” (They have appealed the ruling and denied to accusation). Note how in the article he says “accused of” and “claimed”, because no one has been convicted of anything. It is also important to note that Hamas is the democratically elected government of Palestine. The claim by the Canadian government, (which also denies the rights of Palestinians,) is that the actual government of Palestine is a terrorist organization. The claim is ridiculous and is merely a tool used to blockade funds that would go to the Palestinian state. The argument here against the IRFAN-Canada is very weak. Next he moves on to attacking UK-based Islamic Relief. Its bank accounts overseas have been frozen by the UBS bank. Unfortunately Fatah doesn’t say why it has been blocked. He only continues by saying that the move has “raised the eyebrows of counter-terrorism bloggers”. I don’t know what that is even supposed to mean? It’s that a bit of trivia or is it supposed to make up for a lack of an accusation against Islamic Relief. If they’ve done something wrong to cause the blocking of their bank account, could you please tell us? Afterward that he tells their side of the story: that they’ve been hindered by a wave of anti-terrorism legislation that has come into existence since 9/11 that hinders their legitimate relief work. So basically there isn’t even an accusation made against them as far as I can tell. It doesn’t seem Fatah has anything against the people who participate in the end and fund it. With those (I guess accusations?) out of the way, Fatah swithces gears and gives us a letter that he would like Justin Trudeau to give at the event if he wishes to speak. 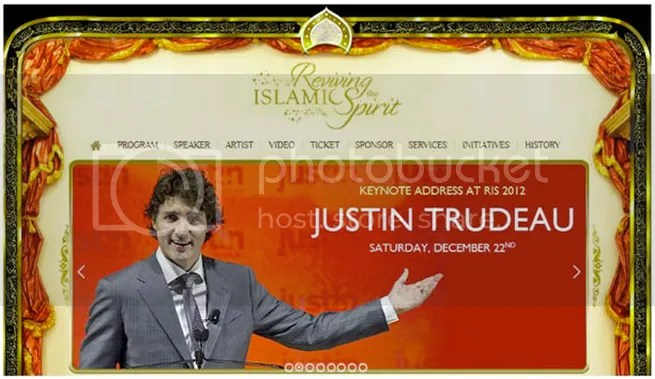 The website for the Reviving Islamic Spirit says Justin Trudeau is the keynote address. It doesn’t really say if he is speaking or not. I personally hope he does I would love to hear what he would say. The letter is long and not worth repeating here, but I will give you the jist of it. He basically asks Trudeau to encourage the Muslims at the event to abandon Sharia law. That they be tolerant of Gays getting married and not condoning them being stoned to death. He wants them to oppose gender segregation and reject traditional oppressive clothing for women. He also says they should reject honour killings and wants Trudeau to recommend they begin boycotts against 7 Islamic states the persecute atheists and agnostics while defending free speech. Seemingly he wishes Trudeau to tell the people at this convention to suppose all these bad things. Which is assuming of course that they do support these things and that they must be told not to. It’s pretty insulting actually, and on top of it he wishes Trudeau to deliver the insult for him. This letter is nearing an inflammatory accusation against the Muslim community. A community Fatah is supposed to be a part of. It’s sad really, making such a blanket accusation against an entire community. However, I’ve come to accept such actions from the right wing media, even if they are Muslim themselves. I find this be quite hypocritical, Sun Media is one of those right wing organizations that constantly claim that Christianity is under attack. Yet here we can see quite clearly that the opposite is happening. He is taking a group of Muslims who’ve done nothing wrong and is portraying them like they’re this big threat. War on Christmas propaganda anyone? I’m wondering if this is how we should view Conservative politicians who go to a Jewish temple and extol the greatness of Israel. Should we take a conservative politician who does this and hold him up as a symbol of conservatives promoting genocide in Palestine? Why isn’t that done? Why does Sun Media feel the need to look the other way when a conservative politician stands up before a Jewish audience and preaches Zionism? Is Jewish religious extremism that promotes genocide alright by the Toronto Sun? It must be because they don’t seem to have a problem with it. Of course this different, the Muslim event has done nothing wrong. Israel is guilty of mass murder and deliberately targeting for death children. What Justin Trudeau is doing is trying to spread good will to the Muslim community in a country that has a habit of slandering them. This is a good thing; it brings people together despite different faiths. Is he encouraging votes by meeting with Muslims? Is this a political move to get the support of Muslims for a Liberal leadership run? A definite yes on both those counts, there’s no doubt in my mind. What sad thing the Conservatives are trying to do here is fear mongering as always. “See, that Trudeau boy is in bed with the terrorists.” All the while the Conservatives are supporting mass murder in Israel. Yes, Fatah most people will be with their families on the 22nd, I however will be at work like a lot of people serving customers. Justin has decided to spend a day of his Christmas holiday with members of the Islamic community. It’s nice that he has a choice of where to be on that day, unlike many individuals such as myself who have to be at work. I’d like to take that day off but I have bills to pay. Enjoy your day off that you choose to take. Perhaps you could spend it with your own family, the Islamic community that you are a part of. You could do that instead of criticizing people who choose to spend it with people of other religions trying to spread good faith. “Ground Zero” Mosque Opponents PWNED!